The advent of color, big musicals, the studio system, and the beginning of institutionalized censorship made the thirties the defining decade for Hollywood. The year 1939, celebrated as "Hollywood's greatest year," saw the release of such memorable films as Gone with the Wind, The Wizard of Oz, and Stagecoach. It was a time when the studios exercised nearly absolute control over their product as well as over such stars as Bette Davis, Clark Gable, and Humphrey Bogart. 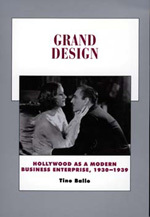 In this fifth volume of the award-winning series History of the American Cinema, Tino Balio examines every aspect of the filmmaking and film exhibition system as it matured during the Depression era. Tino Balio is Program Director of the Arts Institute and Professor of Communication Arts and Academics at the University of Wisconsin, Madison, where he also served as Director of the Wisconsin Center for Film and Theater Research from 1966 to 1982. He is the author of Hollywood in the Age of Television (1990), among other titles.